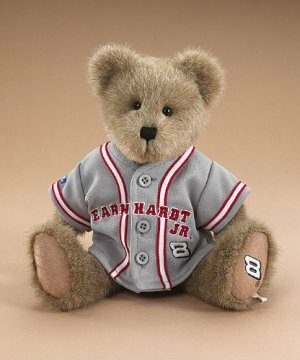 Cuddly, fully jointed plush racin' fan bears wear popular, baseball-style jerseys in grey featuring the official name, color and car number logo of fan favorite Dale Jr.! Jerseys featur..
Cuddly, fully jointed plush racin' fan bears wear popular, baseball-style jerseys in grey featuring the official name, color and car number logo of fan favorite Dale Jr.! Jerseys feature color-coordinated trim piping and authentic color logos. Each bear also features the driver's car number logo on it's foot!� Measures 12" in height and is now retired.